Facebook, Twitter and YouTube all experienced interruptions or outages in Turkey on Friday night amid a military uprising in Istanbul. 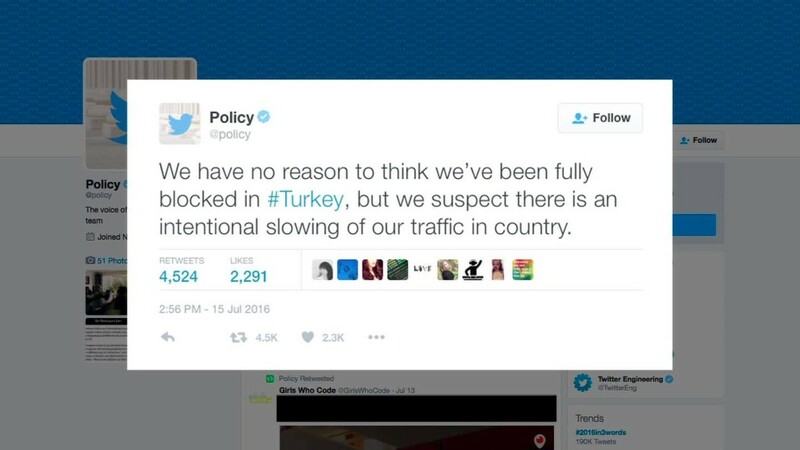 "We have no reason to think we've been fully blocked in #Turkey, but we suspect there is an intentional slowing of our traffic in country," the global public policy team at Twitter said in a tweet. Despite possible efforts to interfere with social media, there were dozens of Facebook Live and Periscope live streams Friday night. The two sites' maps showed users live-streaming all across the country. Many of the streams showed protesters heeding President Recep Tayyip Erdoğan's call to take to the streets. Turkey Blocks, a group that tracks censorship in Turkey, tweeted that all three services were blocked in the country as of 10:50 pm local time. Dyn, another service that tracks Internet performance globally, reported Facebook and Twitter were blocked for "about an hour." "We saw the throttling of connections from Turkey to Twitter and Facebook just after reports of the coup in Turkey," Dyn's director of internet analysis Doug Madory told CNNMoney. Google said in a statement, "We are aware of reports that YouTube is down in Turkey, however, systems seem to be functioning normally." Reps for Facebook did not immediately respond to CNNMoney's request for comment. The U.S. State Department suggested those in the country should "use email/phone call/SMS to contact loved ones in the area," in response to reports that the services were unusable. Facebook and Twitter were reportedly blocked in March after pictures from a deadly car bombing spread on social media. The Turkish government previously blocked Twitter for two weeks in 2014 after then-Prime Minister Tayyip Erdogan attacked the service for circulating leaked recordings that incriminated him. The violent uprising in Turkey left at least 161 people dead. On Saturday, the government said it was in control after the coup, which was perpetuated by members of the military.